The caption on this postcard suggests the train is one of Gilbey‘s gin before it set off “for the docks”. ie London Docks — from the LNWR Camden Goods depot. There seems to be something artificial and contrived about this, as though an artist has taken a photo of an engine and then drawn in a train and the background. Suspiciously,the engine is showing express passenger lights. The wagons are too uniform, and why would gin be conveyed in open wagons and also goods vans? Well, that’s a lovely picture. The 18in Goods looks superb. The seven open wagons at the front might be LNWR. The door banger looks the right shape, they have brakes on one side and those might be diamonds on the side, but the diagonal stripes are most odd. Diagonal stripes usually indicate an end door but the LNWR didn’t have any wagons with two end doors. The L&Y did, but probably the stripes are just re-touched on the photograph. The eighth vehicle is probably LNWR — a (probably 21ft) covered carriage truck — a strange vehicle to have in a train of gin! Another thought — since the CCT is vacuum fitted, the open wagons may also be some of the few LNWR fitted (or piped) LNWR wagons as there is another photo in LMS days of one of these in the area. There doesn’t appear to be a middle lamp-socket on the engine's bufferbeam, so the date would be before 1903. The old headlight code given in Cotterell & Wilkinson’s 1899 book had a green and a white lamp on the bufferbeam for Ordinary Express Goods, and two green lamps for Fast Goods. 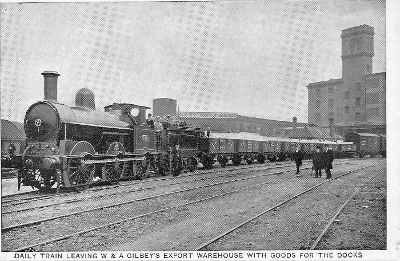 Peter Darley’s fascinating book about Camden Goods Station contains a photograph of the Interchange Warehouse - the large building on the right - and another of open LMS wagons each containing six large barrels, for the “Gilbey Special which left daily for the Docks”.